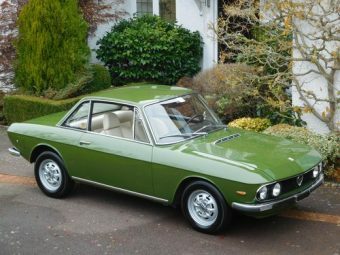 For Sale – Lancia Fulvia Coupe 1.3 Sport / LHD / 1974 / Time Warp! | Classic Cars HQ. For Sale - Lancia Fulvia Coupe 1.3 Sport / LHD / 1974 / Time Warp! This stunning Fulvia has now been through the workshop & is retail ready, what a fantastic example it is, certainly one of the best in terms of structure, originality & driving experience – If you know your Fulvia’s & want a fantastic period correct colour combination please book a viewing! We are truly privileged to offer to the market this time warp, original black plate & highly desirable Lancia Fulvia Coupe 1.3 Rallye Series 2A (3) (818-630). This is an Italia home market 1974 model with a matching numbers 1298cc motor, being UK tax & MOT exempt & comes complete with the original green Italian log book. This incredible find was first registered CT 356505 in 1974 in Catania, Sicily & has remained in Sicily until import into the UK. In fact it has only 3 Italian owners, the last 2 being friends. Mr Annotasi from Ragusa in 1987 & then to his friend Giuseppe Previto also in Ragusa in 2010. Mr Previto had owned a Fulvia in the late 60’s early 70’s and hankered after one ever since, he apparently spent many years persuading Mr Annotasi to sell it. Just out of interest, Ragusa is where some of Montalbano TV programs are filmed. It has a mileage of only 57,500 from new. This is certainly believed as correct. The car speaks for its self however, having only been repainted once to date in circa 2014 to a high standard in the original factory colour of Verde Cascine. This fantastic time warp specimen is the best structurally preserved example I have ever seen, let along had the privilege to purchase. It wears the original factory under seal in the wheel arches & on the undercarriage, with no patches or plates! The factory spot welds are also visible in the wheel arches. Make no mistake this Fulvia has one of the best floors we have ever seen & reflects the dry climate the car has resided in & the low mileage This car drives much as a new Fulvia would in 1974, make no mistake, this is not your average patched & poorly maintained Fulvia. You won’t get another as honest, straight, preserved & out of the box condition. The paint work repainted circa 2014 to a high professional UK standard seems excellent with a deep lustre. 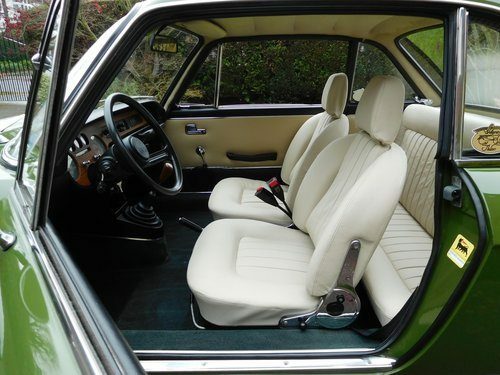 Verde Cascine suits the Fulvia’s stylish lines & matched with the new cream leather interior that our artisan trimmer has loving made in the original shade, the car presents with a most appealing period correct colour combination. The boot floor another known trouble spot is also in excellent preserved condition. This truly fantastic example has a recorded mileage of 57,500. This seems totally correct & the car appears as it left the factory & drives nice & tightly as I can only image a new Fulvia did in 1974. The oil pressure is spot on & reflects the engines healthy state. This is a real find & a true time warp example. 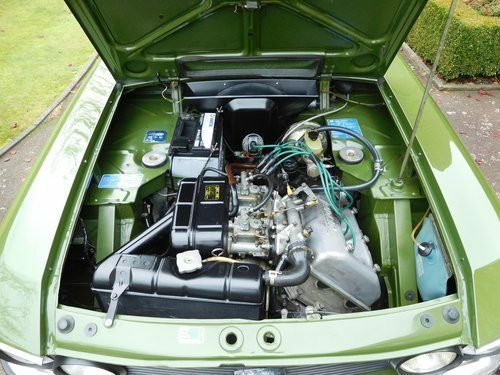 It retains the original matching 4 cylinder 1298cc engine with twin solex carbs. On arrival, post being loaded onto a transporter for its journey to our shores, the owner gained a fresh UK MOT naturally with no advisories & fully UK registered the vehicle. The brake callipers were freed off & adjusted, the vehicle was treated to a full service including the correct engine oil & filter, gear box oil, brake fluid change, rear shocks replaced, upper ball joint & sundries. We were meticulous in our further preparation prior to offering this exception example to the market by undertaking the following works: Fitted a new hand crafted premium leather interior along with replacing the seat foams as required. Fitted a new Varta battery, new oil pressure sensor, new NGK plugs, air filter & oil filter. Filled the fuel with £40 of super unleaded just to be sure! Supplied a Fulvia Key ring, undertook a detailed interior & exterior valet including a full 3M machine polish of the glorious external paintwork. The car is on the button & ready to go & show or just enjoy… Period Lancia Verde Cascine paintwork, with a full new cream leather interior all complemented by the original factory Verdi carpet set – How 1970’s! MOT with NO advisories. Free historic road tax (UK). UK Registered. The vehicle comes with a nice history file containing, Original green Italian log book / liberetto, original factory handbook, original factory Lancia service centre guide, FCA dating letter, DVLA papers & registration number issue papers, invoice dated 13th July 2018 for the sun of £762.58. Keys on Lancia Fulvia key ring, original spare wheel with correct original cover, factory tool kit, factory jack & boot strap. Original Lancia steel wheels shod with excellent matching tyres. It certainly is a genuine cherished example & looks resplendent – Find another as original & well preserved. You could actually use this example for every day use, transportation to the Revival, or as a contender at classic car shows & be proud of it in any circumstance. ‘The Lancia Fulvia (Tipo 818) was introduced at the Geneva Motor Show in 1963 by Lancia & produced until 1976. Fulvias are notable for their role in automobile racing history, including winning the International Rally Championship in 1972, the year of this example. On testing it in 1967, Road 7 Track summed up the Fulvia as "a precision motorcar, an engineering tour de force". Named after Fulvia Flacca Bambula, an aristocratic Roman woman and wife of Mark Antony. The Fulvia was available in three variants:- 'Berlina' (4 door saloon) 'Coupé' and 'Sport' (an alternative fastback coupé designed and built by Zagato on the Coupé floorpan). This stunning example is great fun to drive, not to mention look at! These models are ever increasing in value & a good Fulvia is a great investment opportunity with a strong club following. Find another as well looked after with a low ownership.